Previously I wrote about several aspects of the contradictory attitudes that many evangelical Christians have toward the Jewish state and the Jewish people. Since I try to limit the length of my blog posts to digestible chunks, I didn’t go into every aspect of those attitudes in depth, my focus being primarily about how that particular subset of christianists proclaim their constant support for Israel and its people, while also acting (and sometimes talking) in very anti-Semitic ways. There are other ways these contradictions manifest to influences policies, political debate, and social interactions. First, let’s handle a few caveats: I was raised Southern Baptist in the U.S., so I am most familiar with that particular subset of the larger evangelical/christianist/dominionist community. I have considered myself both an ex-evangelical and ex-Christian for many years—I didn’t leave the church, the church rather violently drove this queer science-loving person out. Finally, I use the word christianist in these essays to refer specifically to people who claim to follow Christ and his teachings, but who actively engage in words and deeds that are contrary to those teachings. I have several times found myself in discussion with conservative christianists of various stripes on the topic of religious freedom where a person will insist they believe in religious freedom, but then say that being muslim ought to be illegal or something similar. When you try to point out the contradiction, many of them are genuinely confused. If you question them closely enough, you’ll find that many believe the word “religion” only applies to Christianity and Judaism. One of the most public examples happened a few years ago when a state legislator in the south freaked out when she found out that the school voucher bill she had fought so hard to pass was being using by muslims in her state to divert tax dollars to their religious schools. She was absolutely livid in her first response, even though allowing parents to use tax dollars to send their kids to religious schools was exactly what the bill had been about. Her staffers and fellow Republicans had to explain to her that “religious schools” meant schools sponsored by any religion, not just Christian and Jewish schools. A friend has told me the story of how back in school she had once signed up for a Comparative Religions class thinking she would finally get to learn what the differences were between Catholics and Lutherans and Methodists, et al—and how only a few minutes into the first class session as the teacher started talking about Buddhists and Muslims and Taoists and so on she started feeling really embarrassed. She hadn’t told anyone that’s what she was expecting, she was merely metaphorically kicking herself because none of the other religions had even occurred to her when she had read the description of the class. There are the large number of christianists who insist that buddhism isn’t a religion, “It’s a philosophy!” I’ve been told many times that hinduism isn’t a religions—“It’s like greek mythology, no one believes it any more!” Tell that to the millions of people participating in the Ganesh festivals every year! And so on. Since about 66% of the U.S. population identifies as christian, while people who subscribe to non-christian religions amount to only about 6% of the U.S. population, it isn’t difficult to understand why many americans would be less well informed on the topic of non-christian faiths. It’s easy to shrug this all off as people being clueless about things outside their own experiences, but it has real world consequences. It influences their decisions in the voting booth, and the policies they are willing to support. To get back to christianist attitudes toward Jewish people, the fact that many of them believe that the word “religion” only applies to a Christians and Jews isn’t a sign of ecumenical thinking. Because most fundamentalist and evangelical christians view Jews as just junior varsity christians. This takes a couple of different forms. Some of them think that Jews are god’s chosen people who just failed to recognize Jesus as the Messiah, but they are still faithful adherents to the oldest of god’s teachings and still worship the one true god—they just aren’t doing it quite right. Others think Jews used to be god’s chosen people, but because they didn’t recognize Jesus, they no longer are chosen, and in fact no longer worship the true god at all. The latter group is where I believe most of the more aggressively anti-semitic actions and rhetoric originates. Even the ones who aren’t openly anti-semitic, only tolerate the continued existence of Jewish people because they believe there is a special duty to convince Jews to convert to christianity. It’s like they think god will give them a gold star for every Jew they convert. 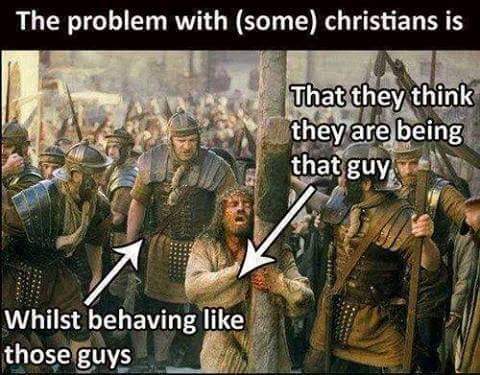 They also have that attitude toward other non-christians: our worth, to them, is solely as potential converts. And the less likely they think we are to agree to become born-again, the less value they place on our lives. And that also, has real world consequences. Note: The title of today’s post comes from “We’re Marching to Zion” by Isaac Watts and Robert Lowry, #308 in the 1956 Baptist Hymnal.